In Shakespeare’s Othello, Desdemona defies her father’s wishes by marrying Othello. In the course of the play, Othello is convinced by the treacherous Iago that Desdemona has been unfaithful to him. Enraged, Othello murders Desdemona for the adultery he mistakenly thinks she has committed. In King Lear, Cordelia, Lear’s favorite daughter, will not profess her love for her father in order to receive one third of his land. Although Cordelia loves her father, she refuses to render false flattery. 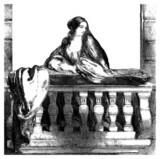 As a result, Cordelia is banished from Lear’s kingdom. When Lear goes mad, Cordelia returns to attend to her father, but Lear doesn’t recognize her. Eventually, Lear regains his sanity and recognizes Cordelia. Before reconciliation can be made, father and daughter are sent to prison where Cordelia is eventually hanged. In Romeo and Juliet, Juliet’s family, the Capulets of Verona, ban her from associating with their archrival Montagues. Unlikely circumstances cause Juliet to fall in love with Romeo, a Montague, and Romeo is equally smitten with Juliet. The lovers secretly marry and have one night together before Romeo is banished from Verona. With the aid of a well-intentioned nurse and a friar, a plan is devised that will allow the couple to be together. The plan goes awry and results in the deaths of both lovers. In my novel, To Sleep … Perchance to Die, Mai Faca and Jake Warden are lovers forbidden by Mai’s family from being together. As Juliet and Romeo did, they devise a plan to skirt the family prohibitions. In the end, the plan backfires – Jake commits suicide and Mai flees the country. What may be said of the extraordinary women I’ve presented? Each did what they felt they must do although it meant defying family. As a result of their decisions, three of them died, and the fourth nearly did. (Mai Faca redeems herself in the second novel of my trilogy, Revenge Best Served Bloody, and she continues to play a prominent role in my third unfinished novel.) Each should be celebrated for placing conviction above all else. It is the greatest among us who are willing to do what they believe right no matter the outcome.